This is radically different to the alleged big bang story, which has embryonic galaxies forming soon after the big bang and, by accumulation of mass through mergers. Galaxies grow, but always from matter initially created in the big bang. And quasars are assumed to be supermassive black holes with the mass of a galaxy, that are the early progenitors of the mature galaxies we see around us today. Soon after their discovery, quasars were assumed to located at great distances because of their high redshifts. They are the highest redshift objects in the sky and if you apply the Hubble Law then they are at the greatest distances. This is the main point of contention. The big bang community say that their redshifts are cosmological, due to the expansion of the universe. The alternative cosmology community, who all reject the big bang, but many like Arp, who believed in a static or quasi-static universe, do not believe their redshifts are distance indicators, but something intrinsic to the quasar, a property not yet understood. And within that community there is doubt as to the origin of the Hubble Law itself. Arp’s noted the patterns of quasars that seemed to be paired around active galaxies and with similar redshifts. Something like that is shown in the picture above. They seemed to be aligned, in opposite directions, within about 20 degrees of the minor axis of what they called ‘parent’ galaxies,. Arp described a process that he saw repeated throughout the cosmos. Quasars are ejected in opposite directions from parent galaxies and over time their intrinsic redshifts change in downward discrete steps. This is a process where galaxies are born from the dense hearts of other active galaxies. He sees the aging of the ejected quasars into these new galaxies. See illustration below. 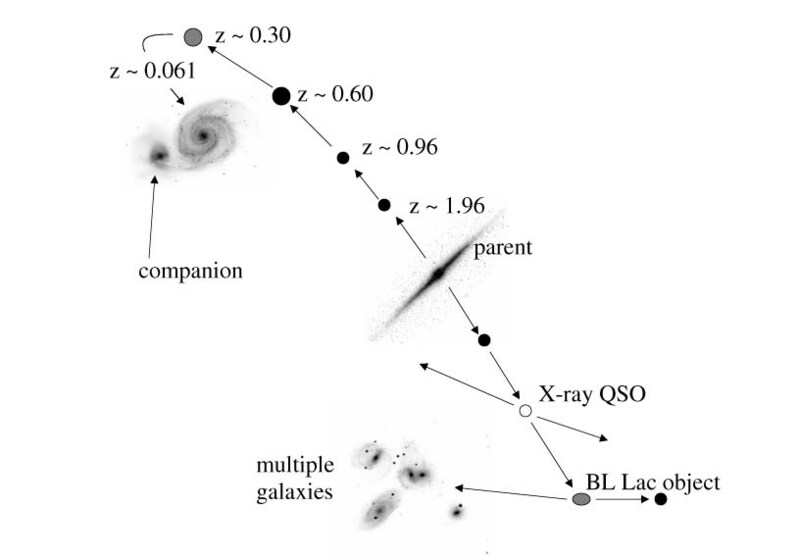 Arp’s model of quasars being ejected from a parent galaxy and changing over time. The process is for multiple births of galaxies in hierarchical structures, spatially and temporally; something like a fireworks display where many explosions eject small glowing centres that then explode to liberate more glowing centres.6 On top of this, due to the forces of gravity, these galaxies form whirlpools in space, some in spirals some highly distorted and peculiar. The galaxies then form into clusters and then clusters into superclusters. This is a totally different picture to the standard big bang theory. Arp’s evidence for galaxy formation by ejection of quasars from the centres of active galactic nuclei is extremely compelling. Putting this into a biblical perspective, Arp’s photographs of peculiar galaxies may well be revealing direct visual evidence of the creative hand of God during Day 4 of Creation week, when scripture tells us “…he made the stars also.” (Genesis 1:16). In fact, his astronomical observations may well be the most significant for creationist cosmology since Galileo. Arp, H. Seeing red, redshifts, cosmology and academic science, Apeiron, Montreal, 1998; Arp, H. Quasars, redshifts and controversies, Interstellar Media, Cambridge University Press, Berkeley, California, 1987; Arp, H. Companion galaxies: a test of the assumption that velocities can be inferred from redshift, Ap J 430:74–82, 1994; Arp, H. The distribution of high-redshift (z>2) quasars near active galaxies, Ap J 525:594–602, 1999; Arp, H. Catalogue of discordant Redshift Associations, Aperion, Montreal, 2003. C.C. Fulton and H.C. Arp, The 2dF redshift survey. I. 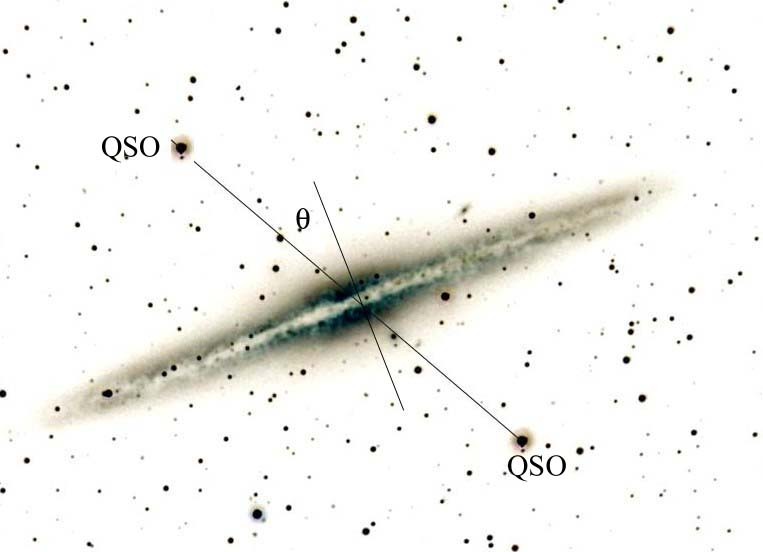 Physical association and periodicity in quasar families, Ap J 754:134-143, 2012. F. Hoyle, G. Burbidge, and J.V. Narlikar, A different approach to cosmology: from a static universe through the big bang towards reality, Cambridge University Press, Cambridge, UK, 2000. ← Universe: Expanding or Static?